Show Rating: (83) – I had production value issues! Out of the blue. The power-hungry DeColt brother said that there's been a lot of speculation regarding the Main Event of Mid Summer Madness!! We'll hear more from Alex's brothers later tonight, as the three of them will compete in the Main Event... in a tag team match!! Both of these tag teams did an excellent job in this match. 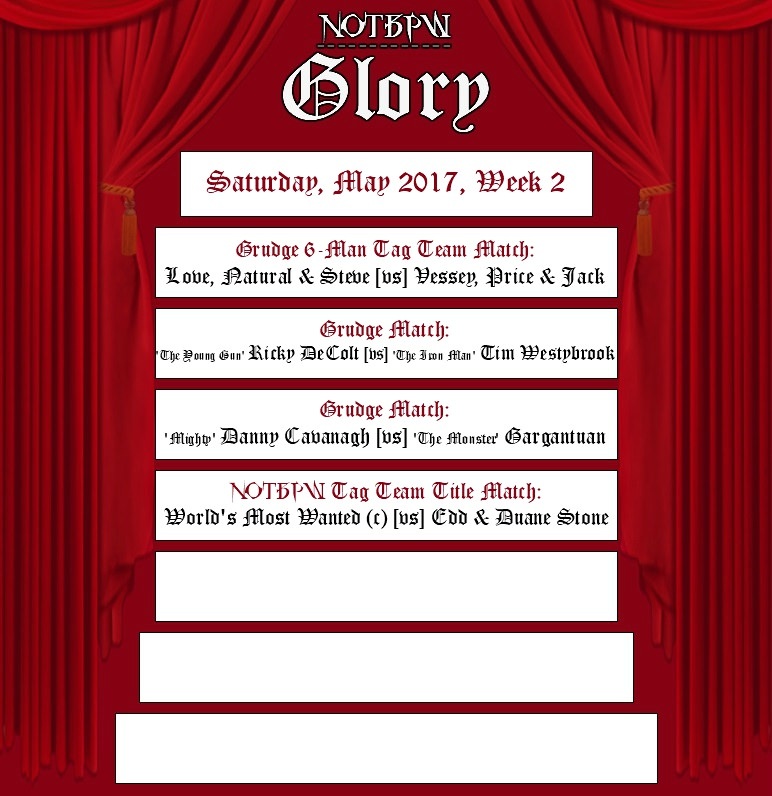 The NOTBPW Tag Team Champions: World's Most Wanted were watched from backstage by their Glory opponents Edd and Duane Stone, and what the Stones saw was a polished performance from both Thrill Seeker and Jacob Jett. They were beaten up by John Maverick and Julian Watson for most of this match, but exploded into life at the end when Jett was tagged in for the 'hot tag'. Jett ended it by flying off the top rope to hit his 'Emergency Landing' finisher on Watson! Duane nodded along, but didn't really have much input... At Glory, World's Most Wanted defend against The Stones!! Then later on in the show, after Dan DaLay complained about supposed 'nepotism', he was told he could leave too!! Then so was DaLay's tag team partner Derek Frost... and DaLay's son Robin, who is in developmental, rounded off the five!! Mark Griffin made a good showing of himself tonight, but he was in the ring against the ultra-talented Ernest Youngman. The 24 year old has a long way to go before he's considered a top name in NOTBPW. But with The Ring Generals and his 'mentor' Sean Deeley helping him out like this, he could remain undefeated for a long, long time. He won it tonight by whipping Griffin into the ropes, and then blasting him with 'The Hit'! And when Aldous opened his eyes, and was disrupted from his meditation, he told Mutant to unleash that anger!! The big man flew across the room, and slammed Donte Dunn backwards through the door!! Mutant ended up lifting Strong up onto his shoulder, and dropping him down onto a chair!! Dunn was then hit with a lariat as he came back into the room, and landed hard on his back!! Nobody gave him a chance in the re-match, but it's arguable that Hernandez would have won without any help from Cavanagh!! Back to the in-ring action, and one half of the Can-Am Blondes tag team: The Natural, was taking on one of their fierce rivals: Christian Price. These two teams have been at each other's throats for months, and it was no different here tonight. Owen Love was minding his own business on the outside of the ring when Cameron Vessey tried to jump him. The veteran Love managed to counter the sneak attack though, and he sent Vessey flying into the ring post. The attack may not have worked, but it ultimately had the desired affect. In the ring, The Natural was distracted, and he walked on to a 'Stud Stopper' and was pinned! Price and Cameron Vessey learned recently that they would be teaming with Jack DeColt at Glory!! Their opponents will be their rivals: The CanAm Blondes, and their partner... Steve DeColt!! This match will be a star-studded Main Event... With both teams looking to get one over on their rivals heading into Mid Summer Madness!! This match marked the NOTBPW debut of recent House of Stone Graduate Solomon Gold. It was a huge moment for the 20 year old from Tennessee, but one that Harrison Hash cared little about. He was just solely focused on defeating the young upstart, and he did it in spectacular fashion. For the finish, he hooked Gold up for his 'Century Suplex' (delayed vertical). As he dropped Gold down, he made Gold land on his feet with his back to Hash, allowing Hash to lock in his 'Montreal Deep Sleeper', which made poor Gold pass out! To his credit, Sean Deeley didn't bring out the rest of his 'Shooters' for this match, opting to go it alone to prove he's worthy of a Television Title shot. However, as the match wore on, it looked increasingly unlikely that 'The Shooter' himself could win! Triple Threat Matches are historically No Disqualification Matches, but things broke down in a hurry after around the 12 minute mark. Aaron Andrews had thrown Sonny Wildside out of the ring, and he lined the hurt Deeley up for his Flying Body Press. But Ernest Youngman, Dean Waldorf and Marv Statler hit the ring and began attacking him. Wildside got back in, but he too was taken out by the three athletes at Deeley's disposal. The referee could have allowed it, but he instead called for the bell, and threw the match out! After the referee's decision, Sean Deeley and co. were furious... and Aaron Andrews and Sonny Wildside took the brunt of their anger!! The four on two attack didn't last long though, because James Hernandez slid under the bottom rope and started taking people out!! But the real story about this segment, was what does Dan DaLay know about Alex DeColt...?! And will we ever find out...!? More on that next week... Tonight in the ring, the crowd got a shock when 'The Monster' Gargantuan arrived!! He doesn't have a scheduled match... They knew that... He was just pacing... Until he demanded a microphone!! He threw the microphone down... and carried on pacing around the ring!! Until 'Mighty' Danny Cavanagh answered the challenge!! A rare smile crept across the usually emotionless Gargantuan's face... and he nodded, and mouthed the word: 'GLORY'...!! It looks like 'Mighty' Danny Cavanagh and 'The Monster' Gargantuan will be going 1 on 1 next Saturday night!! An incredible Main Event here, with all four men getting plenty of offence in. Tim Westybrook proved his worth in the Main Event scene alongside the three DeColt brothers with a flawless performance. He hit some awesome power moves on Ricky DeColt in particular! But it was the final few minutes where this match was won and lost for these two makeshift teams. Ricky DeColt badly needed a tag, and he managed to somehow kick Tim Westybrook in the gut on the apron, and then knock Jack DeColt down with a lariat. Both DeColt brothers crawled towards their respective corners, but as Jack arrived at his, Westybrook hopped down and stepped backwards! He clearly feigned a rib injury from the kick from Ricky DeColt, and told Jack he couldn't get in the ring. Jack was furious, but his anger turned to fear when he heard that Steve DeColt had been tagged in! 'The Outsider' beat Jack up for a couple of minutes, but then Ricky DeColt tagged HIMSELF in!! It was Steve's turn to be furious now, but watched on as Ricky hit his 'DeColt .45' to pick up the win! Westybrook shoved Steve into his brother, and they collided heads!! 'The Young Gun' Ricky DeColt will go 1 on 1 with Tim Westybrook! !